After months of nervous anticipation, the jury is back on the water potential from this winter's Sierra snowfall. Make no mistake: the flurry of late-season precipitation has helped, but has not rescued California from its historic drought. More than a week's worth of rain and snow that rounded out March and seemed to be shaping up as an "April miracle" gave the meager snowpack a significant boost, from about a quarter of the 30-year average to about a third. That's the good news. The bad news: it's still only 32 percent of average. 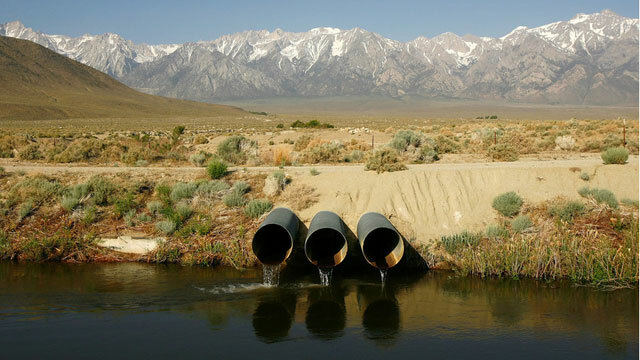 In the northern Sierra, it's even worse: water content is still only 23 percent of normal. This is an ugly prospect for a state that counts on the "frozen reservoir" for about a third of its water. Of the five monthly surveys officials do of the Sierra snowpack each winter, April is considered the most important benchmark. This is usually when the snowpack has peaked, the wet season is winding down, things are warming up and the runoff season begins. "February and March storms have probably kept us from breaking records for historic drought this year," Mark Cowin, the head of California's Department of Water Resources told reporters, "but they certainly haven't rescued us from that drought." Cowin said that state and federal water managers will try to harness some of the recent precipitation by temporarily increasing pumping of water to customers south of the Sacramento-San Joaquin Delta. As water managers were weighing in the scant water content of Sierra snows, the Association of California Water Agencies weighed in with its 400-plus members, issuing an unusual plea for them to ask more sacrifices of its urban customers. The Sacramento-based trade group is urging local water managers to "request heightened water conservation from their customers in response to drought conditions." It's the first time that ACWA has made such a call to its member agencies. “Reducing water use has been standard practice in California for more than a decade," noted ACWA President John Coleman in a written statement, "but given the severity of this drought and the impacts starting to be felt across the state’s economy, it is imperative that all residents step up their conservation efforts now."